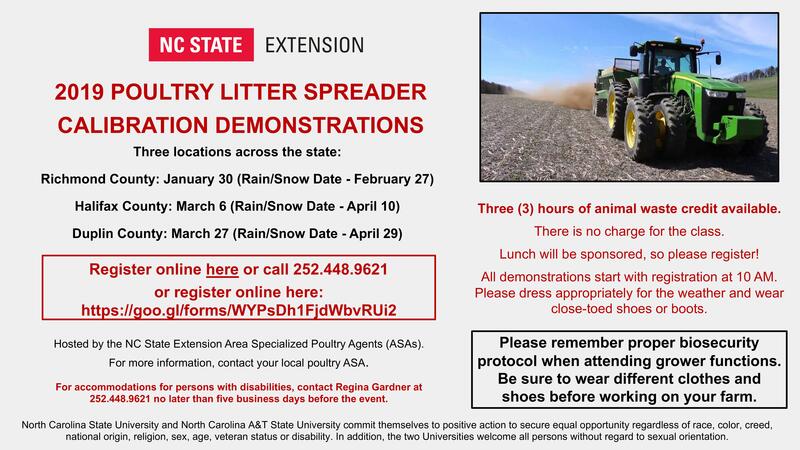 Hello everyone, this is just a friendly reminder about the poultry litter spreader calibration demonstrations coming up in 2019! We also wanted to let you know these demonstrations have been approved for technical specialist credits too!! Register through our online form. For accommodations for persons with disabilities, contact Regina Gardner at 252-448-9621 no later than five business days before the event. The January 30th training in Richmond County has been rescheduled for February 27 due to weather!